We’d love your help. Let us know what’s wrong with this preview of MYTHS OF INDIA by Deepak Chopra. Read the inagural issue for FREE! Deepak Chopra presents the tales of the immortal gods and goddesses of Indian myth who reign over humanity and wield the forces of the Universe. For generations, all enterprises in India have been launched with an invocation of His name. He is called the Vinayak - God of Endeavors, Vighneshwar - the Remover of Obstacles. Perhaps the most adored of all in the Indian Pantheon, Ganesha is the God that best represents India - benevolent, wise and noble. Come with us on a journey to witness the origins of a God, a timeless tale of an inanimate golem crafted from primordial clay by Uma, the all-mother. His innocent bravado in defying Shiva, the mightiest of the Gods and even giving up his life to uphold a simple promise he made to his mother, the twist of fate that intertwines his destiny with another and the 'rebirth' of the two as they become one. To ask other readers questions about MYTHS OF INDIA, please sign up. It was an interesting telling of Ganesha's origins, but I was disappointed by the battle scenes. I understand that the way of Buddhism is peaceful, but it's a graphic novel and I expected a little more. We have a young boy defeating a centaur, an entire army of men, and challenging Shiva himself. Those could make some epic imagery, but alas each scene was but a panel. Luckily, it is free. A divine comic book indeed! The writing and illustrations are on point for what it aims to do. I look forward to reading more. This origin story for the God Ganesh is well done. A favorite of the Hindi religion and popular with those facing life's obstacles. I like the fact that this book has modern illustrations and even dialogue. The story is told well and evokes the feelings of Ganesha, in my point of view. I also like the Introduction, explaining the qualities of Ganesha and his significance in Hinduism. Overall, this is a nice comic book. Five stars. Shorter than I would have liked but it was beautifully illustrated. It was a good read of a timeless story. 2.5 Tells of the creation of Ganesh by Shiva. I assume that later issues expand on the myth. A beautiful story told in a delightfully rendered version. I will be sharing this with my grandchildren and hoping for more in the near future. As someone already familiar with the story, I went through the pages without feeling impressed until the last page when it was tied together and it got me, right there. Seriously, I teared up. A wonderful myth that bought tears to my eyes. I recently lost my Mother and reading this was an healing experience. This explains the origin of the Ganesha. Powerful read. Beautifully drawn. Great retelling of an important history. Easily read for a beginner, but grasping enough for a mature seeker. Can't wait to read the other ones!!! Does not suit the readers who have little knowledge about Hinduism. Narrative could have been a better option of presentation. 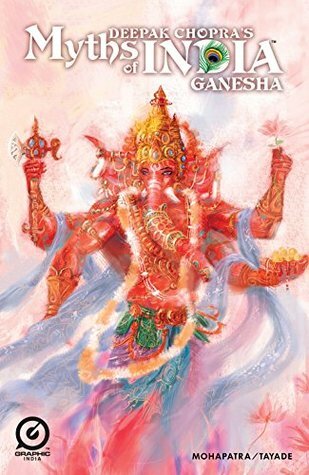 This book is very helpful and informative when it comes to explaining how Ganesh came into being--- Remover of Obstacles. This is such a cool series. A very interesting illustration and retelling of old myths. Excited for the rest of them. As a global leader and pioneer in the field of mind-body medicine, Chopra transforms the way the world views physical, mental, emotional, spiritual, and social wellness. Known as a prolific author of eighty books books with twenty-two New York Times best sellers in both Deepak Chopra, MD serves as the Founder and Chairman of The Chopra Foundation, and Co-Founder of the Chopra Center for Wellbeing.